Copyright © 2013 Masa-Yuki Yamamoto et al. This is an open access article distributed under the Creative Commons Attribution License, which permits unrestricted use, distribution, and reproduction in any medium, provided the original work is properly cited. Characteristic infrasound waves are clearly recorded at Syowa Station (SYO), East Antarctica, involving physical interaction in surrounding environments at the continent and Southern Ocean. A Chaparral microphone type infrasound sensor is deployed at SYO during the International Polar Year (IPY2007-2008), the most diverse international science program held recently. Continuous recorded data in 2008-2010 indicate a contamination of background oceanic signals (microbaroms). The characteristic signals are identified as the “microbaroms” with peaks between 4 and 10 s in the records. The peak amplitudes of microbaroms may be enhanced by the extratropical cyclonic storms and wind noises in Southern Ocean. The microbaroms has relatively lower amplitudes during austral winters, which may be caused by the larger amount of the sea-ice extent around the Lützow-Holm Bay near SYO, with decreasing the ocean wave loading effects. In addition, the large energy with intrinsic periods between 12 and 30 s are observable under excellent storm conditions, particularly in local winter. The oceanic effects appearing on infrasound data are modulated by the presence of sea-ice and explained by a relationship between the atmosphere-ocean-cryosphere systems. Microbaroms measurements could be a useful tool for characterizing ocean wave climate, as well as a new proxy for monitoring a regional environmental variation in Antarctica. “Infrasound” is defined as sub-audible sound with frequencies ranging from the cut-off frequency of sound (3.21 mHz at 15˚C, 1 atm) to the lowest frequency of the human audible band (20 Hz). This frequency range historically is introduced by many studies  and presents new opportunities for remote sensing of the Earth’s atmospheric physical environment . There is an emerging body of published results on infrasound waves generated by diverse sources, such as volcanic eruptions, ocean waves, earthquakes, lighting strikes, sprites and airplane passages [3,4]. It has also been reported in several papers that infrasound waves generated by thunders, sprites, fireballs, meteorite falls, artificial re-entry of vehicles, and the auroral activities in polar region [5-7]. For a remarkable example associated with the atmosphere-ocean-solid earth interaction, the Sumatra-Andaman great earthquake of 26 December 2004 not only produced the tsunami waves, but also produced recordable infrasound waves in the atmosphere . Moreover, the 2011 Tohoku-Oki, Japan earthquake (Mw = 9.0) produced unequivocal infrasound signals associated with the large tsunami . Free oscillations of the Earth from great earthquakes can also affect even the upper atmosphere. Another striking example is given by infrasonic shock waves generated by a large meteorite fall in Japan . An artificial hypersonic reentry of Hayabusa capsule and spacecraft also created infrasonic shock waves [11, 12]. Because of its large wavelength, infrasonic waves can propagate in atmosphere without high attenuation by viscosity of atmospheric molecules, hence, it is focused as a new propagation band not only for horizontal but also vertical energy transport. Infrasound, which exists between audible sound and atmospheric gravity waves, is highlighted recently by the long-distant propagating characteristics as well as by speculating as a candidate of sources to cause the upper atmospheric disturbances. 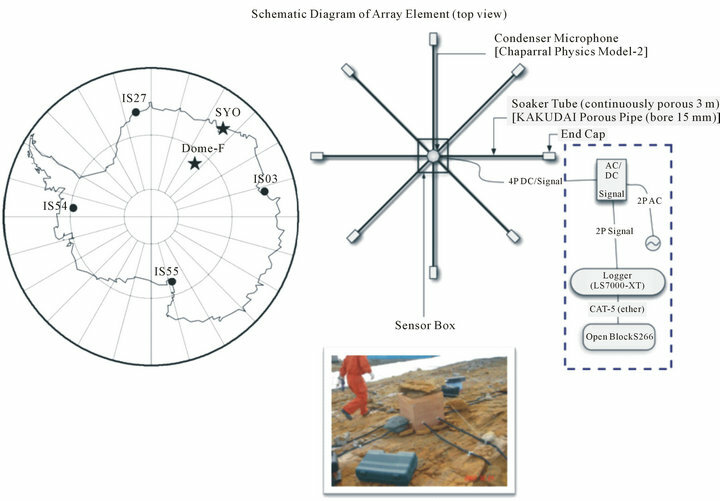 In this paper, characteristic features of infrasound waves are introduced by using a continuous data recorded at the Japanese Syowa Stations (SYO; 69.0S, 39.6E; Figure 1), in the Lützow-Holm Bay, East Antarctica. The oceanic loading effects appeared on infrasound signals are demonstrated associated with the interaction between the atmosphere and the underlying Southern Ocean. The oceanic effects appeared on the infrasound waves’ propagation are modulated by the presence of sea-ice extents and could be explained by a physical interaction between the atmosphere, ocean and cryosphere. To unveil the status and changes of planet Earth viewed from the polar region, the International Polar Year (IPY 2007-2008) was the world’s most diverse and very broad international science program held recently . It was conducted during the 50th anniversary of the International Geophysical Year (IGY1957-1958) and greatly enhanced the exchange of ideas across involved nations and scientific disciplines efficiently. The sort of interdisciplinary exchange helps us understand and address grand challenges such as rapid environmental change in the polar region and its impact on society. During the IPY, a significant number of science projects have been conducted including 63 Japanese endorsed activities . As an inter-disciplinary geoscience project at the IPY, the “Polar Earth Observing Network (POLENET; http://www.polenet.org)” was the largest contributions in establishing a seismic and GPS network in Antarctica. Several kinds of environmental signals associated with the atmosphere-ocean-cryosphere-solid earth systems are detected in the continent and surrounding oceans. Oceanic and cryoseismic waves are likely to be influenced by environmental conditions, including atmosphere, and the study of their time-space variation provides indirect evidence of short term climate change. Characteristic features of infrasonic waves associated with environmental changes were clearly identified in Antarctic stations deployed during the IPY. Loading effects from the Southern Ocean are recorded by infrasound sensors at SYO. Figure 1. (Left) Infrasound stations currently operating/planning in Antarctica, including the Japanese Stations of Syowa (SYO) and Dome-F (as planned). (right) Schematic diagram of the observation system at SYO. The infrasound sensor inside the adiabatic wooden box, attached with eight air-pipes (hose array system). SYO . As one of the endorsed projects of IPY, the pilot observation was conducted by the Japanese Antarctic Research Expedition (JARE). The sensor has a flat frequency response from 0.1 to 200 Hz against the input of atmosphere variations. The hose array alinement aimed to reduce the wind noises by adopting the mechanical low-pass filtering. Continuous data have been retrieved with sufficiently high sampling rate of 100 Hz, by using the 24 bit data-logger (LS7000-XT) and the Linux Server (Open Blocks 266). A schematic diagram of the observation system is illustrated in Figure 1. The infrasound sensor has been installed inside the adiabatic wooden box, that was attached with eight air-pipes (hose array system) in order to reduce the local effect from wind noises. Analyzing data from last three seasons (Figure 2), continuous background signals are identified, which correspond to co-oscillation of oceanic loading from both the local vicinity and the regional Southern Ocean. The first identical spectral peak between approximately 12 and 30 s might be arisen from the direct transfer of ocean gravity wave (swell) energy to infrasonic waves. The second, more prominent, the peak between 4 and 10 s, as known as the “microbaroms”, arises from nonlinear interaction of interfering ocean wave components that produce a pressure pulse at double their frequency [16,17]. Although the microbaroms is widely recorded, the longer period over 12 s has not been recorded to date. Theory predicts radiation of microbaroms into the atmosphere from oceanic source process , but the theory does not predict for more longer waves. Figure 2. 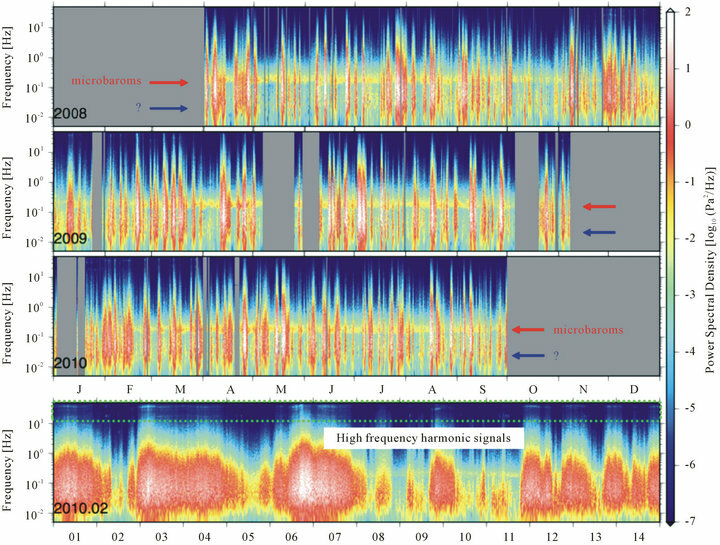 Moving window Power Spectral Densities (PSD) of infrasound signals at Syowa Station (SYO), Antarctica, during the three seasons in 2008-2010. The fourth trace represent the extended PSD for a month in February, 2010. Signals corresponding to the periods for longer waves for 12 - 30 s, the Microbaroms for 4 - 10 s, as well as the high frequency harmonic signals are indicated by blue, red and green colors, respectively (inside the figure). by the presence of the sea-ice extent impeding both the direct ocean-to-continent coupling that generates the single-frequency microseisms (SFM) and the coastal reflection which is an important component in the generation of the double-frequency microseisms (DFM) . Accordingly, it is expected that a similar signature could appear in the microbaroms at SYO. The Power Spectral Density (PSD) of infrasound signals appears to correspond to the atmosphere variations tied to changes in weather conditions, as well as the spreading area and the thickness of sea-ice in the surrounding bay. Time variations in data, moreover, correspond to episodic storm events (wind noises) that occur with intervals of a few days. Energy from storms sometimes extends to the lower frequencies, below 0.1 Hz, indicating physical interaction between atmosphere-ocean and the solid Earth in microbaroms frequency ranges. Along with oceanic originated waves, continuously recorded signals show unexpected harmonic overtones from a few tens of Hz to the lowermost human audible band. The repeating harmonic signals are clear in Figure 2, and may reflect local phenomena near the surface, containing ice-related dynamics in cryosphere , otherwise the resonance effect in the observation system such as inside the porous hoses . The cryoseismic sources are likely to reflect environmental conditions, and their temporal variation may provide indirect evidence of climate change. Over the last few decades a global infrasound network was constructed by the Comprehensive Nuclear-Test-Ban Treaty Organization to monitor for nuclear tests (CTBTO; ). One of the objectives of CTBTO is to characterize the detection and location capabilities of this network at regional and global distances, another is to explore ways to improve these capabilities and enhance the understanding of wave propagation through the atmosphere for observed events. As the station distribution in southern hemisphere is too sparse for analyzing many natural infrasonic phenomena, increasing the number of stations in Antarctica (at moment four stations by USA (IS54, IS55), Australia (IS03) and Germany (IS27); Figure 3) firmly contributes in accumulating precious data in the high southern latitudes. Along with CTBTO, infrasound stations in the Antarctic contribute to Pan-Antarctic Observations System (PAntOS) under the Scientific Committee on Antarctic Research (SCAR) of the International Council for Science (ICSU). Figure 3. A global distribution map of the Comprehensive Nuclear Test-Ban Treaty Organization (CTBTO) infrasound network. 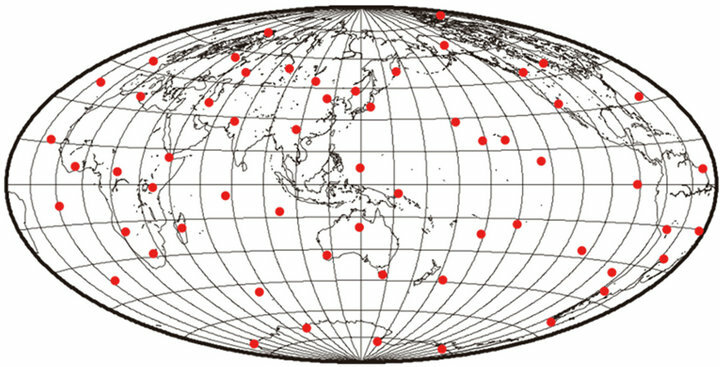 CTBT stations are labeled by the red solid circles (modified after Butler and Anderson, 2008). sity, complementing other geophysical measurements. The infrasound data at SYO, moreover, demonstrate unique signals with harmonic over-tones that may be influenced by local near-surface processes, such as katabatic winds or the ice dynamics. Infrasound observations in Antarctica, consequently, could present unique new proxies for monitoring environmental change as well as temporal climate variations in the southern polar region. There is wide acknowledgment that the polar regions play a critical role in Earth’s systems. The Southern Ocean and the Antarctic ice sheet, as well as the overlying atmosphere and its response to climate, potentially have great importance. Monitoring the dynamic response of the polar environment between the ocean and atmosphere would be important components of a long-term effort to observe climate change on a global scale, given that much remains to be learned about the physical mechanisms of interaction between the atmosphere-oceancryosphere system and the geosphere in polar regions. Continuous observations by a sufficiently large number of high-quality monitoring stations, as well as theoretical work, will be necessary to make progress. Given the high cost and technical difficulties of continuous observation in the Antarctic, such as work will continue to require strong international collaboration beyond the end of the IPY. Characteristic infrasound waves are clearly recorded at SYO, East Antarctica, involving physical interaction in surrounding environments at the continent and Southern Ocean. A continuous data during the IPY represents a contamination of microbaroms with peaks between 4 and 10 s. The peak amplitudes may reflect the influence of extratropical cyclonic storms and wind noises caused in Southern Ocean. The microbaroms has relatively lower amplitudes during austral winters, caused by the larger amount of the sea-ice extent around the Lützow-Holm Bay near SYO, with decreasing the ocean wave loading effects. The oceanic effects appearing on infrasound data are modulated by the presence of sea-ice and explained by a relationship between the atmosphere-ocean-cryosphere systems. Microbaroms measurements could be a useful tool for characterizing ocean wave climate, as well as a new proxy for monitoring a regional environmental variation in Antarctica. We would like to express our sincere appreciation of our many collaborators in the Japanese Antarctic Research Expeditions (JARE; Prof. Kazuyuki Shiraishi, Directorin-General of NIPR and others). Infrasound observation at SYO was supported by the Ministry of Education, Science, Sports and Culture, Grant-in-Aid for Young Scientists (B) 19740265, 2007 (P. I. as Yoshiaki Ishihara). The authors would like to express their special thanks to Prof. Richard Aster of New Mexico Institute of Mining and Technology, and one anonymous referee for their critical reading and significant comments on manuscript. M. Tahira, “A Study of the Infrasonic Wave in the Atmosphere-Multi-Pipe Line Microphone for Infrasonic Observation,” The Journal of the Meteorological Society of Japan, Vol. 59, 1980, p. 4. M. Hedlin, M. Garces, H. Bass, C. Hayward, G. Herrin, J. V. Olson and C. Wilson, “Listening to the Secret Sounds of Earth’s Atmosphere,” Eos Transactions of the American Geophysical Union, Vol. 83, No. 48, 2002, pp. 564- 565. S. J. Arrowsmith, M. Hedlin, L. Ceranna and W. Edwards, “An Analysis of Infrasound Signals from the June 3rd, 2004 Fireball Over Washington State,” InfraMatics, Vol. 10, 2005, pp. 14-21. C. R. Wilson, “Infrasound from Auroral Electrojet Motions at I53US,” InfraMatics, Vol. 10, 2005, pp. 1-13. M.-Y. Yamamoto, Y. Ishihara, Y. Hiramatsu, K. Kitamura, M. Ueda, Y. Shiba, M. Furumoto and K. Fujita, “Detection of Acoustic/Infrasonic/Seismic Waves Generated by Hypersonic Reentry of HAYABUSA Capsule and Fragmented Parts of Spacecraft,” Publications of the Astronomical Society of Japan, Vol. 63, No. 5, 2011, pp. 971-978. C. Rapley, R. Bell, I. Allison, P. Bindschadler, G. Casassa, S. Chown, G. Duhaime, V. Kotlyakov, M. Kuhn, O. Orheim, P. C. Pandey, H. Petersen, H. Schalke, W. Janoschek, E. Sarukhanian and Z. Zhang, “A Framework for the International Polar Year 2007-2008,” ICSU IPY 2007- 2008 Planning Group, ICSU, Paris, 2004, p. 57. N. Sato, H. Ito, M. Kanao, H. Kanda, T. Naganuma, T. Ohata, K. Watanabe and T. Yamanouchi, “Engaging Asian Nations in IPY: Asian Forum for Polar Sciences (AFoPS) (Japanese Section),” In: I. Krupnik, et al., Eds., Understanding Earth’s Polar Challenges: International Polar Year 2007-2008 Summary by the IPY Joint Committee-5.3, Art Design Printing Inc., Edmonton, 2011, pp. 555-574. Y. Ishihara, M.-Y. Yamamoto and M. Kanao, “Current Status of Infrasound Pilot Observation at Japanese Islands and SYOWA Antarctica, and Development of New Infrasound Sensor Using Optical Sensing Method,” AGU Fall 2009 Meeting, San Francisco, 14-18 December 2009, Article ID: A13D-0244. R. Butler and K. Anderson, “Global Seismographic Network (GSN),” IRIS Report, 2008, pp. 6-7.